The purpose is to establish the general framework to which individual Events can be added. An Event Calendar allows Events to be organized into meaningful, descriptive groupings that help to provide insights into and collaboration about a specific Data Point or range of Data Points. 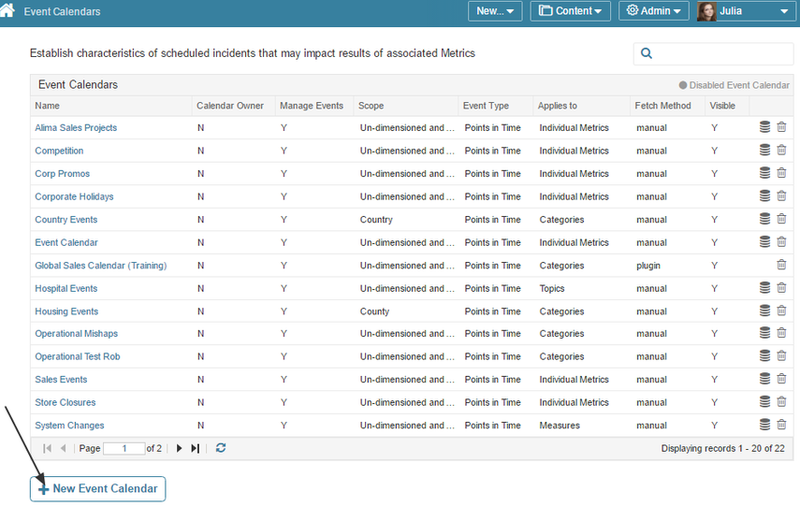 The Events feature allows a user to see how a Metric's values change based on external occurrences. A 'System Outages' Event Calendar: Each time a data center problem shuts down a telemarketing center, that occurrence would be recorded on this Event Calendar. If sales 'dip' during the period while service is being restored, the decrease might well be attributed to the loss of computer operations. A 'Company Holiday' Event Calendar: If all of your operations are suspended on corporate holidays, this calendar is used to record each holiday for an upcoming year. Then, when no sales are made on these holidays, the Event appears on the Charts of all Metrics or Multi-Metrics associated with the Calendar. The list of calendars previously created in the system opens. Event Owner: By default, the person creating an Event Calendar is automatically designated as an owner; however, you can select any Administrator or Power User for this role. Scope limited by: You may apply this Event Calendar to certain groupings of Metrics, including both Un-Dimensioned and Dimensioned, only Un-Dimensioned or to a selected Dimension. 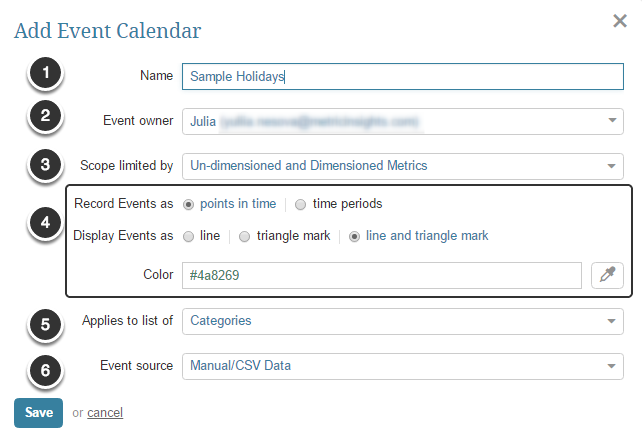 This example applies the Event Calendar to any Metric, regardless of Dimension. Save your entries to proceed with creating of an Event calendar. 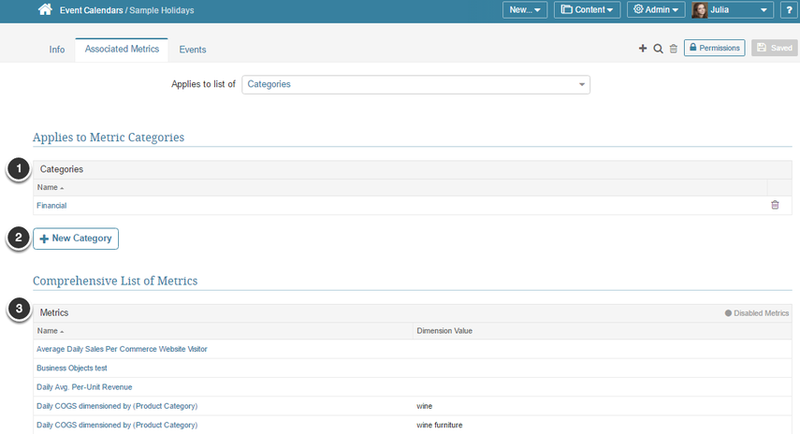 Save your entry to assign this Event calendar to all Metrics in this Category.